The term “espresso” seems to imply that the drink of the same name was created for those who are perpetually racing the clock, ever in need of squeezing a few more precious minutes out of every day. But the name relates more to the process of creating the delicate brew than the buzz one should expect after downing a shot or two. While it is true that espresso contains more caffeine than a regular coffee (about 60 mg in a single shot vs. 12-15 mg in an ounce of drip brew), chances are pretty good that you’re drinking upwards of 8 – 12 oz. of regular coffee at a time, and therefore, consuming more caffeine per drink. But espresso is not meant to be downed speedily. This is a bold and powerful treat, one that’s slightly creamy and accentuated with the smallest whip of froth. A single ounce is wonderful enough to stand all on its own while a splendid aftertaste lingers just long enough to remind us of its exquisiteness without overstaying its welcome. Espresso isn’t a glory hound, though, and doesn’t mind lending its profile to other drinks, such as cappuccinos, Americanos, and flat whites. A passion for sharing fine espresso created a common goal for New Zealand-born Andrew Meo and Italian Daniele Berenbruch, the founders of Milan-based Rocket Espresso. Put two coffee lovers together in a room and you’re bound to get great conversation, but put two souls whose love of the brewed bean burns as brightly as their entrepreneurial spirit, and you’ll get the beginnings of a company that produces marvels as elegant as anything you’ve ever laid eyes on. In English, the phrase “Fatto a Mano” means “made by hand.” But to discount this as a mere sales pitch would be criminal, as it’s the very declaration on which Meo and Berenbruch built their espresso empire. 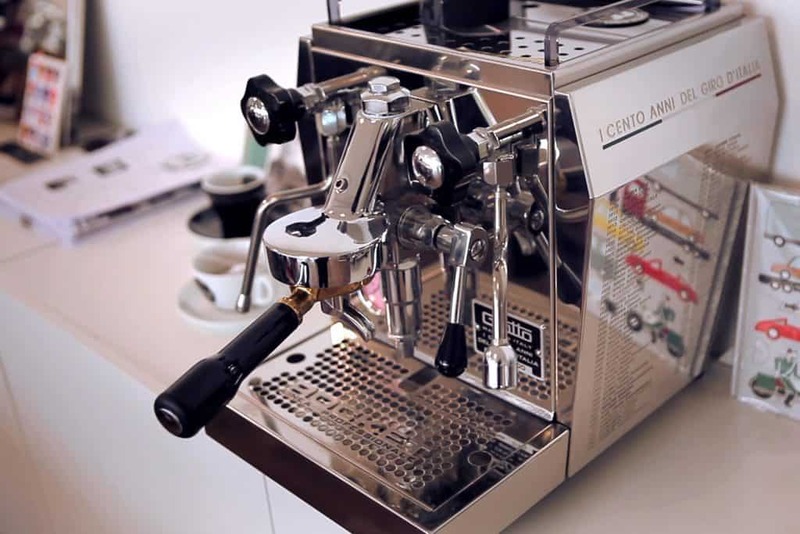 Via a handful of videos shared over on the company’s website, Rocket Espresso offers a glimpse into what goes into making their brewers, and it’s a work of art on par with any of the other masterpieces exported from Milan. At first glimpse, it’d be easy to mistake the craftsmanship on display as skilled engineers constructing the engine of an exotic sports car, a fact that’s even more impressive when it becomes apparent that what you’ve actually witnessed is the expert assembly of a magnificent espresso machine. You won’t see a robot arm welding individual pieces, or conveyor belts loaded with parts being sorted and screwed together by employees dressed in hairnets, white coats, and less-than-ecstatic facial expressions. That’s not how things get done at Rocket Espresso; from intricate wiring and construction to the final stages of testing to make sure that every function lives up their standards while exceeding those of their customer base, each phase of manufacturing is completed by a real person, one who wants the recipient to understand and appreciate the attention to detail on display every time they brew a drink. 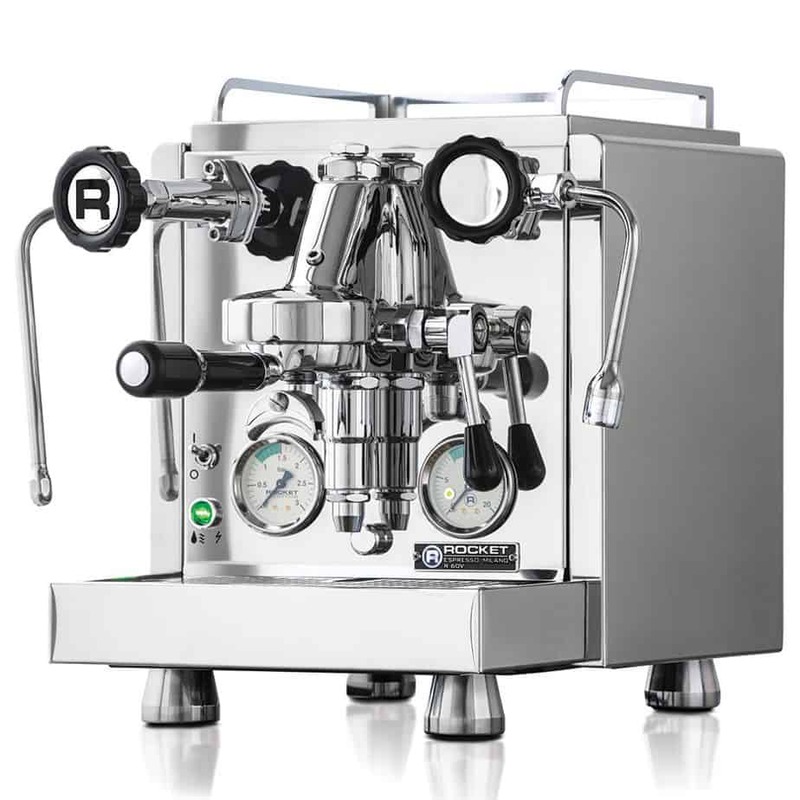 Rocket Espresso produces a choice few brewers for both the domestic and commercial sectors. By keeping the selection relatively small, they’re able to ensure a high standard of excellence across their entire catalog while also serving not to confuse customers with a bloated line of products. There’s a total of six different domestic offerings, each built to exacting standards and created to address the individual needs of coffee lovers. State-of-the-art features vary across each model, and include double boilers, in-line water install capability, and PID (proportional integral derivative) control, which keeps temperature ranges in check for a smooth brew every time. 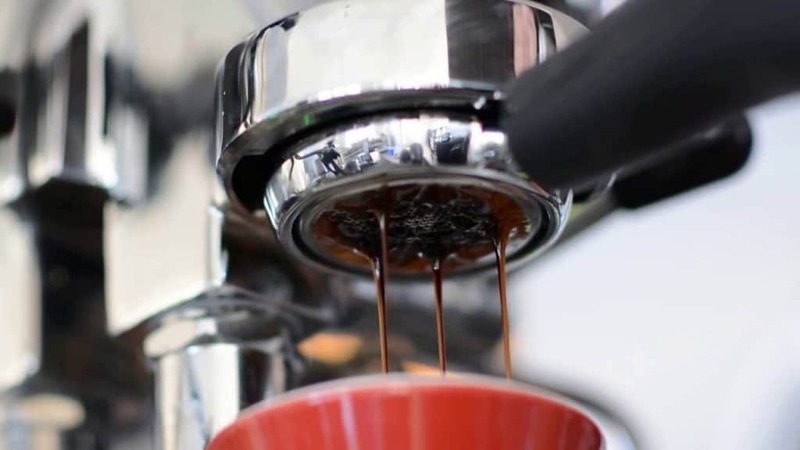 Espresso is produced by forcing hot water through coffee grounds (as into “express” out a cup of coffee), and the amount of pressure typically used is right around 9 bars. The R 60V allows for the ultimate in customizing the perfect cup by adjusting exactly how much pressure is used in order to extract out the deliciously aromatic oils. This pressure control option, however, isn’t just something that occurs at the beginning of brewing. The process here is a five-step procedure, at any of which the user can fine-tune the amount of pressure being forced through the grounds! This is the only of Rocket Espresso’s models capable of achieving this, and the resultant cup of coffee can be as strong, mild, or anywhere in between that’s preferred. Additional features include remote control operation, Wi-Fi connectivity for real-time status updates, and dual boilers. The R 58 contains many of the same great features of the R 60V, but omits the pressure-controlling feature. Users can still operate the brewer via remote control, and the double boiler system ensures an ideal uniform temperature across both the water reservoir and the steam wand so each mechanism can operate as efficiently as possible. 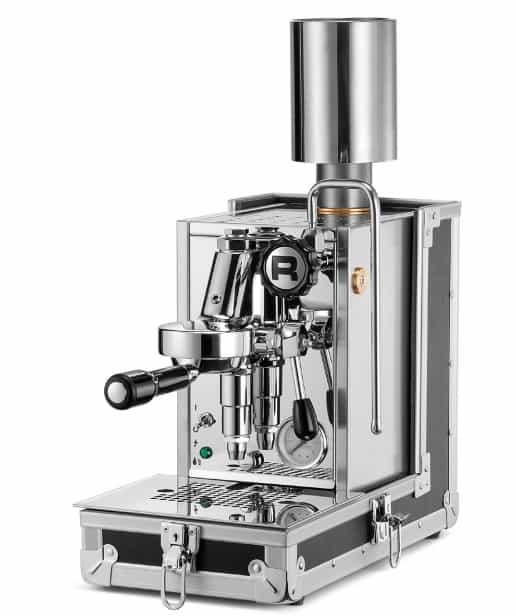 Commercial appliances are built to handle the excesses of brewing cup after cup for months and years on end, and the Evoluzione R is built with many of the same steadfast features you’d find in high-end coffee house equipment. Whisper quiet performance is achieved by inclusion of a rotary pump, and the unit is available in two different body styles, the Giotto and the Mozzafiato. This brewer allows temperature customization akin to the R 60V, albeit not as extensively. So what does that mean for the Type V? Adjustability for different grinds, brews, and flavors for a cup of coffee suited to the unique tastes of each user. The Type V is also available in two different body styles, the Giotto and the Mozzafiato. An appropriate name befitting of a brewer that’s been built to bring big flavor into smaller abodes. All of the internal mechanics have been arranged in a space-saving design without comprising of the efficiency of the machine. With an anticipated 2018 release date, Rocket Espresso has deemed this to be the “world’s first truly portable espresso machine.” Nested inside of a case that mimics the aesthetic of a traveling musician’s equipment case, the exterior shell can be removed to reveal a compact brewer that’s ready to hit to road. Rocket Espresso’s domestic business is healthy and robust, and their commercial offerings are no different. High-quality models with names such as the R 9, RE A, RE S, and Boxer, are pumping out shot after delicious shot for coffee house patrons around the world. In fact, many of the same great design mechanics that are implemented in the commercial products have been scaled down and utilized in the construction of the domestic line. So now that you’re up to speed on all of the amazing products that Rocket Espresso offers, it’s time to rush right out and buy one, right? Unfortunately, picking up one of these beauts isn’t as easy as hopping down to the local big box store. Rocket Espresso knew they were on to a good thing when they started their business, and they’ve gone to great lengths to make sure that when someone buys from them, what they’re getting is authentic. It’s well known that innovation plants the seeds for imitation, but stick to reputable dealers and be on the lookout for the six points of authenticity to avoid winding up with a cheap knockoff. If you’re in the market for an espresso maker for your home, one that can faithfully recreate the taste of a decadent espresso anytime you’d like, you can’t go wrong with any of the Rocket Espresso devices. And since every brewer will churn out a uniformly tasty drink every time, buy the model that is best built for your specific situation. If you’re a micro-manager that has to have their hand in every step of the process, pick up the R 60V, with its pressure control feature. Or, if you’re limited on space, maybe consider the Appartamento model. And since an exquisite machine demands the finest beans, consider picking up a few bags of Rocket Espresso’s Salva Vita coffee. Their in-house blend of Guatemalan, Colombian, and El Salvadorian beans serves as a superb complement to your new brewer. It’s a shot of coffee that’s not much more than an ounce in size, but for those who long after the rich, creamy texture of a steaming hot espresso, it’s an ounce of brewed bliss that Rocket Espresso expertly delivers by way of Milan, Italy.